The people of Afghanistan under Taliban rule are subjected to an extreme form of music censorship. The only musical activity permitted is the singing of certain types of religious song and Taliban "chants". The report traces the gradual imposition of music censorship since 1978, when the communist government of Nur Ahmad Taraki (the correct name is Noor Mohammad Taraki -RAWA) came to power in a violent coup d'etat. During 14 years of communist rule, music in Afghanistan was heavily controlled by the Ministry for Information and Culture, while in the refugee camps in Pakistan and Iran all music was prohibited in order to maintain a continual state of mourning. The roots of the Taliban ban on music lie in the way these camps were run. In the Rabbani period (1992-1996) music was again heavily censored. In the provincial city of Herat, which the author visited for 7 weeks in 1994, professional musicians had to apply for a licence, which specified the kinds of material they could perform, songs in praise of the Mujahideen and songs with texts drawn from the mystical Sufi poetry of the region. This cut out a large amount of other music, such as love songs and music for dancing. The licences also stipulated that musicians must play without amplification. Music could be performed by male musicians at private parties indoors, but Herat's women professional musicians were forbidden to perform. While in theory male musicians could perform at wedding parties or Spring country fairs, experience had shown that often in such cases the agents of the Office for the Propagation of Virtue and the Prevention of Vice, religious police, had arrived to break up the party and confiscate the instruments, which were usually returned to the musicians some days later when a fine or bribe had been paid. There was very little music on local radio or television in Herat. Broadcasting time was anyway severely curtailed, to about two hours per day. If a song was broadcast on television one did not see the performers on screen but a vase of flowers. Names of performers were not announced on radio or television. Instrument maker had re-opened their businesses, and the audio cassette business continued, with a number of shops in the bazaars of Herat selling music cassettes, some of locally recorded Herat musicians. "To prevent music... In shops, hotels, vehicles and rickshaws cassettes and music are prohibited... If any music cassette found in a shop, the shopkeeper should be imprisoned and the shop locked. If five people guarantee, the shop should be opened, the criminal released later. If cassette found in the vehicle, the vehicle and the driver will be imprisoned. If five people guarantee, the vehicle will be released and the criminal released later. To prevent music and dances in wedding parties. In the case of violation the head of the family will be arrested and punished. To prevent the playing of music drum. The prohibition of this should be announced. If anybody does this then the religious elders can decide about it." 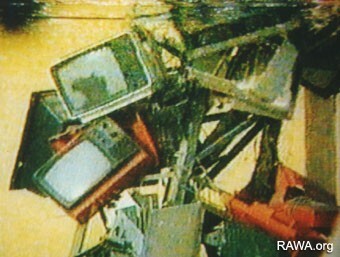 All musical instruments are banned, and when discovered by agents of the Office for the Propagation of Virtue and the Prevention of Vice are destroyed, sometimes being burnt in public along with confiscated audio and video cassettes, TV sets and VCRs (all visual representation of animate being is also prohibited). The only forms of musical expression permitted today are the singing of certain kinds of religious poetry, and so-called Taliban "chants", which are panegyrics to Taliban principles and commemorations of those who have died of the field of battle. These chants are themselves highly musical: the singing uses the melodic modes of Pashtun regional music, is nicely in tune, strongly rhythmic, and many items have the two-part song structure that is typical of the region. There is also heavy use of reverberation. But without musical instruments this is not "music". The effects of censorship of music in Afghanistan are deep and wide ranging for the Afghans, both inside and outside the country. In the past, the people of Afghanistan were great music lovers and enjoyed a rich musical life. Music was an integral part of many rites of passage, such as celebrations of birth, circumcision (male only), and most important of all, marriage. Only death was a rite of passage lacking in musical expression. The lives of professional musicians have been completely disrupted, and most have had to go into exile for their economic survival. The continuation of these rich musical traditions is also under treat. The report makes the following recommendations. (1) To highlight the critical situation as it exists today. (2) To try to give musicians both inside and outside the country economic support, and in the transnational communities, to persuade aid agencies of the importance of music in the lives of refugees. (3) To make sure that what is left from the past is adequately documented, so that something is left for the future. (4) To support the craftsmen who make traditional Afghan musical instruments, for traditional music cannot be played without the appropriate instruments. (5) To support practical musical education programmes in the transnational community and to persuade the relevant agencies of the importance of music coping with the traumas of refugee life.